This is beautiful Connie, love the papers and sweet image. Adorable!!!! I love the design on this and the wonderful mix of papers. Fantastic. What a cutie! I love the paper with the Santa heads!! 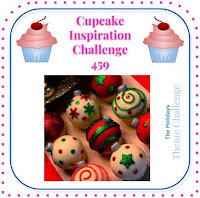 Thank you so much for sharing your amazing project with us in the Polkadoodles Wk 48 Anything Goes Challenge! Hope to see you again soon!